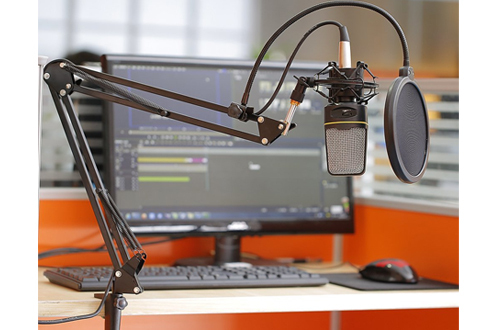 Whether you’re recording music in a studio, performing with live instruments, reading a speech, producing web content such as podcasts or vlogs, or just want a high-quality accessory for voice chatting in online games, the microphone stands will go a long way. 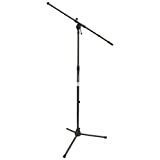 Microphone stands work quite simply, they hold your microphone steady, so you can concentrate on your performance. There are several styles of mic stands. 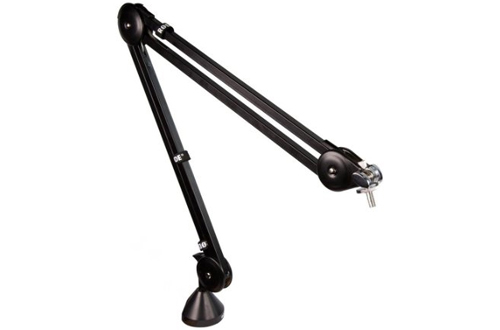 Arm stands to attach to your desk and are quite useful due to their size and manoeuvrability. 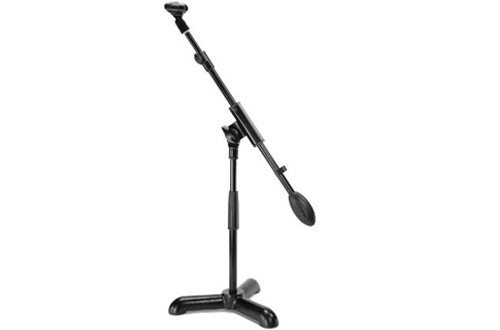 Boom stands stand up via base or tripod, and typically have an extension piece to attach your microphone. These are useful for capturing ambient sounds, live instruments or other performances. Regardless of what microphone stand you are looking at, there are many common features to keep an eye out for. The most important is the stability and construction of the stand. A high-quality metal frame will ensure that it doesn’t wear down quickly. 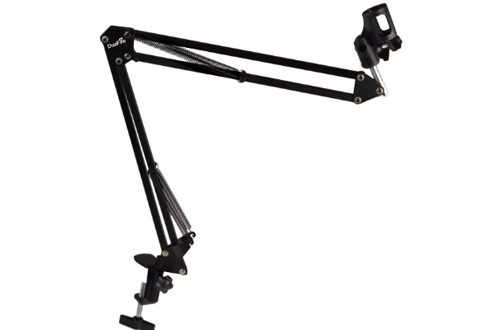 Furthermore, you will want arm stands to have stable joints that don’t sag under the weight, and for boom stands to not wobble during operation. Added versatility can come from the ability to adjust the height and other useful configurations. If you plan on bringing your equipment on the road, having a lightweight stand can make a big difference. If you’re looking for the perfect microphone stand for your desk that won’t cost a ton, this model from Neewer is a good choice. This scissor-style folding type makes it convenient to carry around, and fairly lightweight. 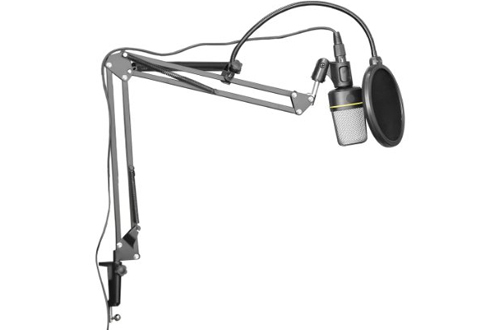 It is made with a high-quality metal frame, and the mic holder uses a plastic clip on. The adjustable legs make it simple to place even on uneven surfaces. The flexibility that the joints give you makes it perfect for studios, broadcasting stations, or even casual home use. 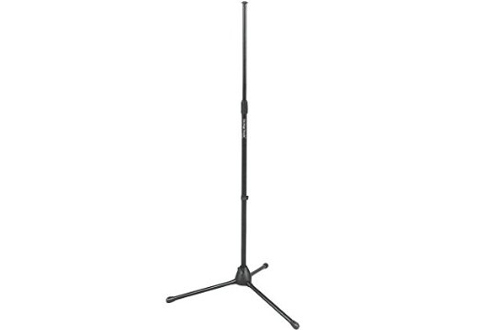 If you’re looking for a fairly priced boom microphone stand, this one from On Stage will work well. It is made from a solid cast end with standard 5/8 – 27 threads. The long 36-inch boom is moulded with a plastic counterweight. This makes manoeuvring the boom much more smooth. It is built with a European style design, which means it has separate clutches for length and the angle of the boom. The professional die-cast clutch locks in between a height from 36 to 63 inches. With its collapsible frame, this tripod boom stands from Samson is inexpensive and effective at getting simple tasks done. It is built from a sturdy steel frame and has a sleek black finish. At the same time, it is ultra-light for simple transport, making it useful for musicians on the road. 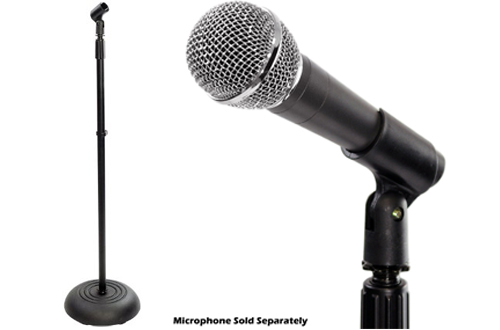 It comes standard with a mic clip to hold most standard sized microphones. For consumers looking for a high-quality, yet simple studio desk mount, this model is a great pickup. The dual-axis swivel action allows for precise positioning, no matter how you sit at your desk. Minor adjustments for ambient noises and stereo adjustments are simple with this mount. 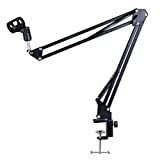 It comes with a 3/8″ threaded adapter, a horizontal reach of 32″, and a vertical reach of 33″. It can hold devices up to 4.4 lbs in weight, and it comes with two desk mounting options. Even though this model from Neewer exudes a professional style and quality, it is also much cheaper than many other models on the market. It is made of all steel, making it very sturdy and durable. However, the joints and arms are light and strong enough to not collapse under the weight of your attached devices. 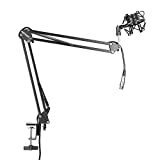 This arm stand comes with a shock mount that is ideal for radio broadcasting, voice over, or recording studios. The shock mount absorbs vibrations so it doesn’t affect the recording setup. Furthermore, it comes with an XLR male to female cable, so you don’t have to fuss about wrapping additional cables around the stand. 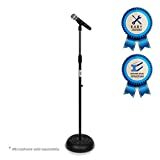 If you’re looking to pick up a professional grade, compact mic stands for your karaoke nights at a solid price, then check out this model from PylePro. It is die-cast and constructed entirely from steel. The sleek black finish complements most interiors with its neutral style. The boom can be adjusted with ease, making it intuitive for most users. You can adjust the height from 33.5″ up to 60.24″, and the entire stand weighs just under 10 lbs. With another solid accessory from Samson, this mini-boom stand is a great pickup as a desk microphone solution if you do not prefer the arm stand style. 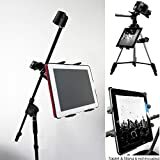 The low profile of the stand also makes it effective for recording other things such as kick drums, cymbals, ambient stereo noise, or anything close to the floor. It weighs 7.5 lbs and the boom can be adjusted for both length and angle. Coming with a very innovative design, this accessory from ChargerCity is a fun and cool gift idea for any budding young musician. 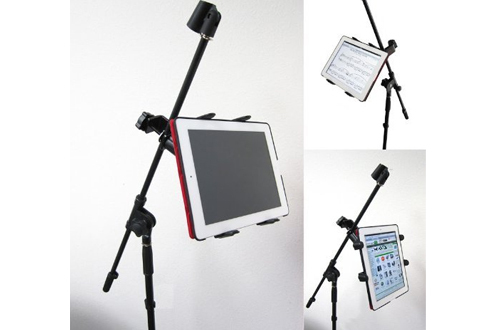 Along with its standard style boom mic stand, it comes with a tablet mount. The mount fits any tablet from 7″ to 12″ with or without a case. You can use this additional feature for any number of things, including displaying sheet music, song lyrics, or even having a speech lined up and ready. It can swivel a full 360 degrees with its ball connection, allowing to switch freely from portrait to landscape orientation. 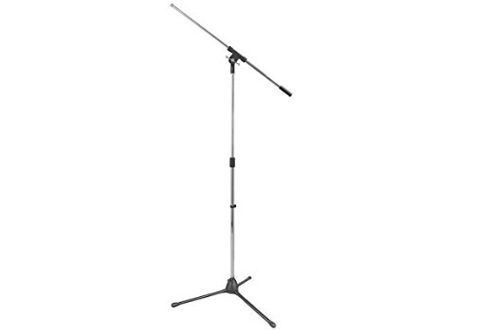 For simple tasks that require a tripod mic stand, this model from On Stage is effective and reasonably priced. The upper shaft uses standard 5/8″ threads. It is constructed of reinforced steel, and the plastic leg housing is surprisingly strong and lightweight. The folding legs come with plastic end caps that improve durability, as well as reduce vibrations from the floor. There is a clip on cable holder to keep things clean, and there is a die-cast zinc mid-point clutch. 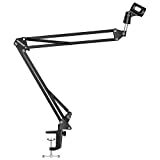 If you’re looking for a cheap scissor arm style mic stand for vlogs, podcasts or other web multimedia content, this model from Duafire will not disappoint. It clamps onto your desk with its simple to use a screw. 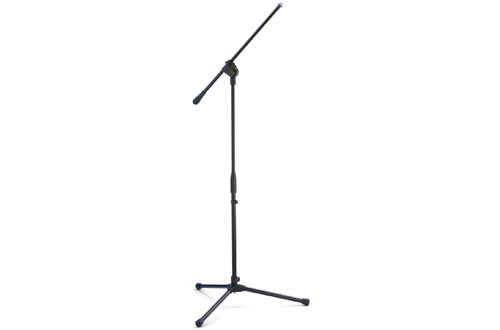 This compact stand holds standard microphones and its adjustable legs make it fit on uneven surfaces. It comes in five colours, including black, teal, red, and white.